1) This is my over the door shoe rack that I use for punches - very handy. They just needed to be labelled. For the Martha Stewart punch around the page sets, there is room to keep both the corner punch with the edge punch in one pocket. 2) Do I see a Big Shot AND a Cuttlebug? Really? Do I really need both? I decided that I didn't and gave the Big Shot away to someone who had never embossed paper before. She LOVES it!! 3) I got one of those Your Story packages at Christmas that they had on cricut.com for $15. There's an old machine behind it. I decided they were taking up too much valuable real estate so they went in the closet. 5) What are books even doing in here? 6) This was extra stuff I was planning to alter. I thought I would make those button trees at Christmas. Do you know how hard that is?? So, that didn't happen. I found room for them in a bin for altered items. I hope you will share some before and after photos of your area! There's nothing like the pressure of putting out a "before" photo to get you motivated! Your room is looking so neat. i thought the part you were doing tomorrow looks great already. Guess you have a different vision of it, so will be interesting what it looks like. WOW! your room is looking great. Thanks so much for sharing your scrap/craft-room re-organization! You have given me courage to look at mine in whole new light! Your room is looking fantastic! I am so jealous. I am so glad that my craft room is not the only cluttered up one in the world! I'm really enjoying the transformation of your room! Such an inspiration you are! Love that you're sharing this process with us. Hey..Hey..girl your room is really taking shape. It's fun being a part of this! I can't wait to see the next step. You have great organization ideas and way to store your craft items and tools. I know it was a big undertaking but for sure there are a lot of gals that will be sprucing up there crafting space and thanks to you they have the tools to do it! Thanks a million for bringing so much JOY into our lives everyday!! Joy- I am so glad to be a part of your e-mails!! When you posted the "before" picture, I smiled!!! It is hard to be creative and NEAT!! Loved the before and after pics! Always looking for neat ways to store my "treasures"! Happy Easter! Looks great!! I love those covers for your machines too....so cute! You have inspired me! I sat down yesterday and organized my Cuttlebug folders in the same way you did yours. It took me several hours, but I persevered and it's all done!!! I often didn't use my Cuttlebug folders because it took so long to leaf through them to find the one I wanted. I think this will make me use them more since I'll be able to see at a glance what I have and what would work with whatever I'm creating. Thanks for the idea and inspiration, Joy!!! Ok. What I am thinking. When you get done with your cleanup then head on over to my mess and help me out. No matter how I try to straighten things up in my "crap" room it ends up looking like a tornado came through. Cannot wait to see where you got the white cabinet with the pink drawers. I will take all the ideas you can throw this way. Great job so far and don't forget to call me when you are ready to come help! Well this organization should make you feel sooooo GOOD! I think it turned out FABULOUS! Thank You for sharing EVERYTHING! This has been fun and very helpful to me! APPLAUD, APPLAUD, APPLAUD! You are giveing us inspiration on our craft rooms now. Great ideas. Fun in the Sun cartridge would be awsome to win since summer is just around the corner. 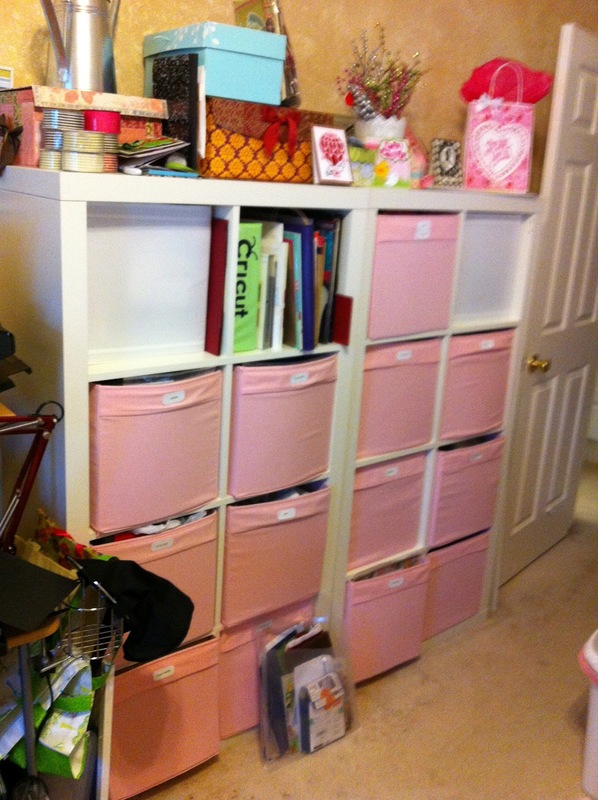 Love it when someone shares how they organize their scrapbook space. I cannot tell you how many times I have re=organized my space which is in my guest bedroom, plus I make jewelry and I have that space to deal with. My guest can sleep in the bed and that is all. the whole room is a craft room, wall to wall and even in the closet. I am such a sucker for everything new in scrapbooking. I so look forward to your tips. You do a good job with explaining just enough. Thanks and keep them coming! Thanks for sharing your before and after photos. It is always fun to see how someone organizes so much craft stuff. Your cleaned up room looks so pretty and hopefully will save you a lot of time by not having to hunt for things. I recently had a new home built for me and as this was going to be one and only chance to have my dream work space. I had what was to be a family room turned into my crafting space with custom built shelfs. I can't find the main work area photos, but you can see the other areas. The messy desk is my inking station, so I used my old beat up desk for that. What a difference in space! How generous to pass along your unused equipment. I will have to remember that their are some people who have yet to try some techniques that might if given the right equipment. Pay it forward and it will bring joy to all!! Thanks for bringing that forefront in my mind. Looks like a nice area to work-play in. I love how the cuttle bug cover matches your cricut cover. I am really enjoying all your organizing ! Thanks for sharing. Looking great. When can you come help me organize mine? !!! I look forward to your craft room transformation photos and info everyday!! I can't thank you enough for sharing and explaining so well!! I will definately be posting before and after photos of my room, but not until they are finished building my craftroom walk-in closet. I can't really do much until then, and they aren't starting until May, so it will be a couple of months, I can't wait!! 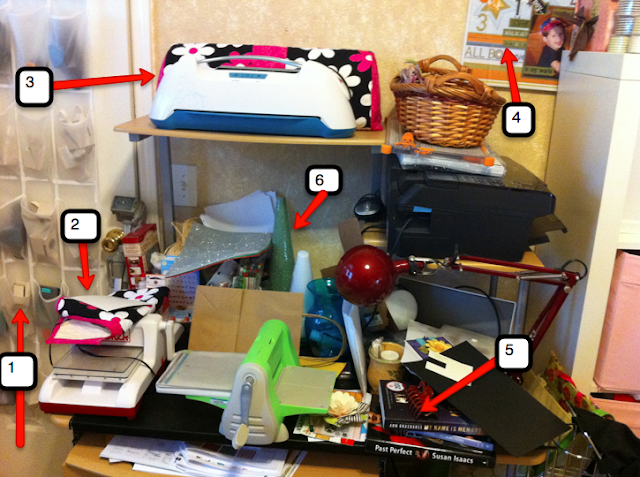 have junky craft room, do you travel??? Looks good... I love the cube expedit...I also want covers for my machines. Wow, Looking awesome...I can't wait for tomorrow:)! I am inspired! Can't wait to get started on mine. Although I don't have near the amount of stuff you do!! The one thing I have trouble organizing is my scrap cut up paper which I hate to throw away, do you have any good ideas as to how to organize it. Looks like your room is coming along quite nicely! Such amazing results! I'm feeling guilty when I look at my room. Do you hire out? Thanks for being so transparent & showing us that we are not the only ones that allow our craft rooms to get unorganized and chaotic. I love your site & try to visit it on a regular basis. I have the Sports Mania cartridge but have not used it. Love what you did with the gift bag. My grandson is not old enough for sports, so I am glad I have it. Love the black and white Imagine cartridge. I would so love to win it, I have a new Imagine cricut. thanks for the chance to win. Love this. Still trying to finish the remodel of my soon to be craft room, but I'm looking forward to having a specific room just for my crafting projects.